As a chiropractor I look at a fair few x-rays from week to week and a concerning pattern I am seeing is the amount of people, young people, with necks that curve the wrong way. The cervical curve should somewhat resemble a backwards C when viewed from the side, the curve isn’t as much as a C but you get the idea. Many people coming in have a straight or reversed curved yet they don’t have any history of a neck injury. A big factor that I believe contributes to this, and I am not alone, is the way most of us are using our smart phones and devices. 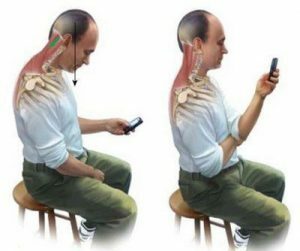 Take a look around the next time you are in public and you will see the majority of people, especially young people, are hunched over their phones with no idea the impact it is having on their body. The normal neck curve is designed to support the weight of the head and protect the spinal cord and nerves. When this curve gets altered it will cause the joints to wear out faster, which can lead to pain and even nerve issues later in life. A few extra kilos of effective weight on the neck is added for every inch forward of the shoulders that the head is. When you are using your smart phone always have the screen at eye level. When your arm gets tired then take a break! A more sustainable posture is to hold the device at eye level with one hand, place your other arm across your belly as if you were folding your arms and use the back of your hand to support the elbow of the upright arm. Be conscious of how you hold your head and neck when working long hours on the laptop. Keep your chin tucked and head and shoulders back.